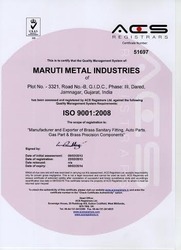 Incepted in the year 2007, our company, Maruti Metal Industries an ISO 9001:2008 certified is a well-established organization that is one of the distinguished manufacturers, exporters and suppliers of a comprehensive range of Precision Brass Turned Components. Our products range encompasses Ceramic Valve, Brass Ceramic Cartridge and Brass Sanitary Fittings. Our precisely designed brass components are regarded for their excellent resistance properties, dimensional preciseness and optimal surface finish. Our components are used in diverse industrial applications. The company is widely known for ensuring optimum quality for the products and following best business practices. Our team is widely known for its commitment towards the timely achievement of organizational objectives. We have segregated them in various groups so as to enable smooth day-to-day operations. Our exporting destinations include popular markets of Europe, Australia, New Zeland, Gulf countries, Middle east. We are also fortunate to serve some of the eminent firms in the market like ESS India Ltd. and Hi-Tech. We are aided by state-of-the-art infrastructural facility for manufacturing a range of supreme quality products. We are committed to serve the satisfaction of our clients for which purpose our team checks the entire range of products to be offered on various parameters. Under the leadership Of Mr. Mahesh, we have been able to touch great heights of success. His rich experience and domain knowledge along with his leadership qualities have aided us in earning the desired prominence and goodwill in the industry. Manufacturing and Trading of a wide range of Brass Components. Our organization treasures a team of diligent & dexterous professionals, which aids us in carving a unique niche in national & international market. These professionals put their sincere efforts to design & manufacture a broad gamut of high-grade Brass Neutral Links, Brass Inserts, Brass Nuts & Sheet Cutting Parts. Further, all our professionals are well-versed with the entire process of this domain, and help us in accomplishing predefined organizational goals. We employ a state-of-the-art infrastructural facility equipped with latest machines to design and manufacture our products. We have segregated our infrastructure facility into various divisions so as to fasten the process of execution. We have best of the equipment that make our product stand apart from what is available in the market. Our advanced machines are in sync with best available technology and that is why our products are of supreme quality and widely known for their durability. We are committed to offer our customers the best in class products due to which we have carved out a renowned place in the market. We are backed by a sound infrastructural facility and an efficient team that aids us in making the qualitative range of products. We also assure the cost-effectiveness of the whole range of the products offered.